Geneva, August 6, 2018 -- Targeting key medical and industrial applications, STMicroelectronics has launched a new high-voltage, compact, robust and cost-effective transmission pulser solution, built using ST’s proven BCD8s-SOI technology that supports analog (Bipolar), digital (CMOS), and power (DMOS) circuits on the same die. 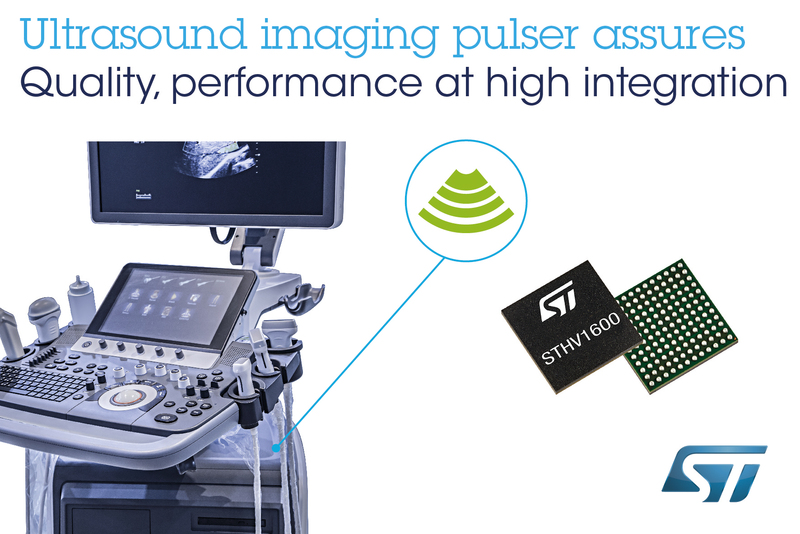 The STHV1600 provides a valuable solution for high-end cart systems and ultra-portable ultrasound equipment, while reinforcing ST’s existing portfolio of 4- and 8-channel pulser transmitters for medical and industrial ultrasound applications. To assure the smallest size, the state-of-the-art STHV1600 transmission (TX) pulser integrates high-resolution beamforming for its 16 independent channels. Offering the capability to program code excitation allows users to implement high voltage stages and store the patterns in memory. For maximum flexibility, each channel can support up to five output levels and the output stages can provide up to ±2A peak output current, independent from the high-voltage power-supply pins. The STHV1600 includes several global blocks including thermal protection for the logic and for each channel, under-voltage protection, and self-biased high-voltage MOSFET gate drivers with internal checks. Moreover, the IC includes 65 kbits of embedded memory to store pattern-control settings. The STHV1600 (in a 144-ball 10x10 TFBGA) is in production and currently sampling to lead customers. An evaluation board for the STHV1600, STEVAL-IME014V1 is currently available to select customers. Please contact your ST sales office.